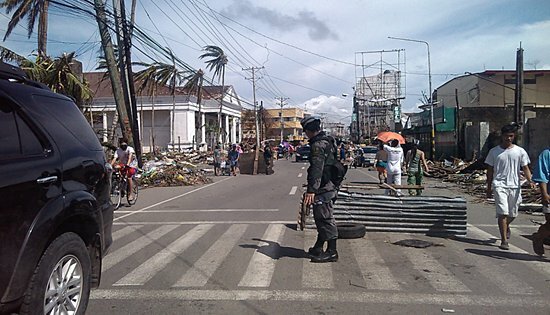 CAMP KANGLEON, Palo, Leyte – There were no major crime incidents recorded in Tacloban City and other affected areas in Eastern Visayas more than a month after super typhoon Yolanda wrought havoc to the region, according to the top police official of the Philippine National Police (PNP) here. Police Chief Supt. Henry Losañes, acting regional director of Police Regional Office 8 (PRO8) during Wednesday’s coordination meeting at the Leyte Sports Academy command center said that since November 8, his office has not received any report of major crimes in Tacloban City and other towns affected by the typhoon in Leyte, Samar and Eastern Samar provinces. “The peace and order situation in the region after the onslaught of the typhoon is generally peaceful although minor occurrence of crimes such as theft is being reported,” Losañes said. He attributed this to the deployment of policemen in strategic areas and the curfew hours that is being implemented by the police from 8:00 p.m. to 5:00 a.m.
“Notwithstanding the personal tragedy and loss of property suffered by our men, they continue to perform their normal police functions and the augmentation personnel from other regions are a big help,” he said. The PNP had sent more than 1,200 personnel that augmented the PRO8 manpower drawn from the PNP’s Special Action Force (SAF) and various regional offices which provided security and police assistances. The police official also acknowledged the role of “force multipliers” in supporting the police in the affected localities. “Barangay tanods are already supporting police officers in patrolling their villages and reporting incident of crimes,” the regional police chief added. MANILA – The National Housing Authority (NHA) has already released P388 million to local government units for the repair of partially damaged houses in Bohol, Vice President Jejomar C. Binay said. Binay said under the Housing Materials Assistance (HOMA), the NHA will provide P10,000 for every family whose home was damaged by the 7.2 magnitude quake that hit Bohol. “The government remains committed in helping the earthquake victims rebuild their lives. This is only the start,” Binay said. Binay added that the municipalities of Maribojoc and Antequera already received checks worth P33,470,000 and P31,780,000 respectively. The Vice President personally handed Mayor Leoncio Evasco and Mayor Jose Mario Pahang the checks when he visited Bohol in November. He added that the checks for the municipalities of Tubigon, San Isidro, Catigbian, Sagbayan, and Loon can now be claimed. According to the National Disaster Risk Reduction and Management Council (NDRRMC), the quake had damaged 73,002 houses (14,512 totally damaged and 58,490 partially damaged) in Bohol, Cebu, Negros Occidental, Negros Oriental, Iloilo, Siquijor and Guimaras. Binay had earlier created a multi-agency task force to see to the housing needs of Central Visayas residents whose homes were destroyed by the October 15 earthquake. The Vice President said aside from the shelter agencies under the Housing and Urban Development Coordinating Council (HUDCC), the Bohol-Cebu housing rehabilitation task force will include the Department of Environment and Natural Resources (DENR), the Department of Public Works and Highways (DPWH), the Department of Social Welfare and Development (DSWD) and the Department of Interior and Local Government (DILG). The HUDCC is composed of the NHA, the Home Development Mutual (Pag-IBIG) Fund, the Home Guaranty Corporation, the Housing and Land Use Regulatory Board, the National Home Mortgage Finance Corporation, and the Social Housing Finance Corporation. PASAY CITY – The bicameral conference committee today approved the spending package of the national government for 2014 amounting to P2.264 trillion, which includes the P100-billion post-Yolanda rehabilitation fund and key provisions to boost transparency and accountability. Senator Chiz Escudero, chairman of the Senate Finance Committee, said one important feature of the reconciled budget version is that it clips the power of lawmakers to recommend projects after the enactment of the appropriations law pursuant to a decision by the Supreme Court that declared pork barrel funds unconstitutional. The bicameral panel slashed by P3.2 billion the original proposal of P2.268 trillion put forward by the House of Representatives – the equivalent of the lump sum allocation of 15 senators and the Office of the Vice President under the Priority Development Assistance Fund or PDAF they gave up after the pork barrel controversy erupted. According to Escudero, the committee also removed the House provisions for consultation with and identification of legislators on programs in the Agricultural Competitiveness Enhancement Fund (ACEF), the Roxas Law for school building funds and the excise tax. Aside from removing the pork barrel system in the budget that enabled legislators in the past to determine projects for their annual lump sum allocations, the bicameral conference committee also introduced provisions for stricter rules and guidelines in identifying nongovernment organizations as partners, Escudero said. He explained that there will be stringent reportorial requirements to Congress, the Commission on Audit and real-time posting on websites on when and where funds are spent by government agencies. “[We] added a provision imposing the heaviest penalty in the Revised Penal Code, the plunder law and the anti-graft law for those who will violate any provision in the above-mentioned laws in relation to the utilization of savings, realignment and lump-sum funds,” Escudero said. He said P20 billion of the rehabilitation fund will be sourced from programmed funds, with the Departments of Social Welfare and Development (DSWD), Transportation and Communications (DOTC), Public Works and Highways (DPWH), Health (DOH), state universities and colleges (SUCs) and local government units as implementing agencies. The rest of the financial requirement for post-Yolanda work will come from unprogrammed funds. Escudero said lawmakers are working on the ratification of the budget by Wednesday so it can be transmitted to the Palace for the President Aquino’s signature. “We are conscious of the fact that the timely passage of the budget is the key to fuel not only the entire government machinery but also our capability and capacity as a nation especially in this challenging time,” Escudero said. MANILA – Vice President Jejomar C. Binay ordered the review of old Comprehensive Land Use Plans (CLUPs) of local government units severely affected by Typhoon Yolanda. The Vice President issued the directive on Monday before leaving for South Africa to attend the memorial and state funeral for former South African president Nelson Mandela. “In Tacloban particularly, we initiated a talk with Mayor Romualdez. We plan to meet with him and his city planning officer to discuss their CLUP and make sure the proper revisions are made,” Binay said. Binay added that the review of CLUPs will focus on the effects of climate change and the adoption of risk reduction measures. “Given the recent calamities that struck our country, it is crucial that we reassess the CLUPs and make sure that they contain measures on climate change adaptation and disaster risk reduction,” Binay said. “Lives are at stake. We cannot afford slipshod planning," he added. Binay said the housing sector has already pushed for initiatives to include climate change response actions in national and local government land use policies. The housing czar cited the Housing and Land Use Regulatory Board’s (HLURB) Zero Backlog Program, which aims to complete updating the CLUP of all local government units (LGUs). The HLURB, which Binay chairs, is the national government agency primarily tasked with assisting LGUs in drawing up their CLUPs and regulating the real estate industry. Its plans and programs are anchored on three major mandates namely planning, regulation and adjudication. In 2011, the HLURB began to require all LGUs to integrate climate change adaptation and disaster risk mitigation in their CLUPs before seeking HLURB Board approval. Meanwhile, Binay emphasized the need for agencies to be united and vigilant in implementing urban development plans. He also called on LGUs to show political will in preventing structures from being constructed on non-buildable areas and danger zones. “We need to ensure that homes and communities are safe from or can at least withstand the effects of climate change and any disaster,” he said. "The national government, the local government, and the people themselves should cooperate closely to promote sustainable urban development,” Binay added. The senator made the call as the whole country commemorates the National Anti-Corruption Day today which, he said, should remind all Filipinos to remain vigilant against graft in government. “We could make this exercise more transparent and interactive by using social media platforms such as Facebook and Twitter to get feedback, suggestions from ordinary Filipinos and netizens,” Cayetano said. He proposed the bicam committee to use facebook and Twitter accounts to engage the public in a more interactive way and give real time updates on the proceedings. Cayetano said this proposal is in support of the move of Sen. Francis Escudero, chair of the Committee on Finance, to have the bicam deliberations on the budget open to the public and be streamed live through the internet. All of these, he explained, will greatly help in making the bicam deliberations on the budget accessible to the public and consequently leave no room for doubt in the Filipino people’s minds. The majority leader is one of the members of the Senate contingent to the bicam panel, which is set to meet next week to harmonize disagreeing provisions between the Senate and House versions of the proposed budget for next year. Cayetano, who is the author of Senate Concurrent Resolution No. 4 which sought to abolish pork barrel in all its forms, is seeking a pork-free, insertions-free 2014 national budget. QUEZON CITY – "As former Batangas governor Antonio Leviste walks out of prison, 449 political prisoners, who were wrongfully accused of criminal offenses because of their political beliefs, will have to spend Christmas again in jail. Some 28 of them are elderly like Leviste. They, too, deserve to be out of prison. After all, they are not criminals," said Marie Hilao-Enriquez, chairperson of SELDA and Karapatan. Political prisoners, including the 13 peace consultants of the National Democratic Front of the Philippines, are now on their second week of fasting/hunger strike, “precisely to call attention to the demand to immediately release all political prisoners. These people shouldn't be in jail in the first place, but that's what we get under an oppressive system – those who uphold the rights and interests of the poor majority of our people are jailed,” she said. In September, Alison Alcantara, 55 died of fatal arrhythmia, sepsis and health-care associated pneumonia. The BS Aquino government ignored repeated pleas for his release on humanitarian grounds and was only taken to the Philippine General Hospital after he fell into coma a few days before he died. “There are at least 48 others who are similarly suffering from various ailments without proper medication,” added Hilao-Enriquez. "These ailing and elderly political prisoners need to be released from prison, where conditions are poor, and may likely prove fatal to their already delicate health," said political prisoner and NDF consultant Ramon Patriarca. Patriarca is detained at the AFP Central Command Headquarters at Camp Lapulapu, Cebu City. Other detainees cited by Patriarca were: Intong Amirol, 70, who also died this year following a stroke and other medical complications; Mariano Umbrero and Crisanto Fat who died in 2011 of cancer and heart attack, respectively, while in prison. "The overwhelming show of people's goodwill and humanitarianism in the aftermath of super-typhoon Yolanda should prod the BS Aquino government to extend compassion to ailing and elderly political prisoners who continue to suffer systemic and systematic injustice," he said. Patriarca also criticized the government's misuse and plunder of public funds which he said "makes the immediate release of ailing and elderly political prisoners necessary as widespread corruption effectively prevented, among others, resources and reforms for the justice system and prison network." The political prisoners' fast/hunger strike will continue up to Dec. 10, to mark the International Human Rights Day. 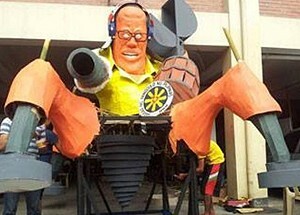 A multi-sectoral protest rally is set in the morning of December 10 at Mendiola where BS Aquino's effigy named P-Noy the Destroyer will be burned. MANILA – Greenpeace today welcomed the Philippine government’s moves to immediately start rehabilitation and reconstruction work urgently needed in Eastern Visayas, following the aftermath of super typhoon Yolanda (international name Haiayan). At the same time the environment group cautioned the government from repeating mistakes from the past and advised newly-appointed rehabilitation head Panfilo “Ping” Lacson to look at the work ahead as a new opportunity to establish sustainable climate-resilient communities using renewable energy (RE) systems. Typhoon Yolanda cost the country an estimated 35 billion Pesos worth of damages to infrastructure and agriculture. Power systems are mostly down with 1,959 transmission facilities partially or fully destroyed. Greenpeace said that solar panels can make a huge difference to disaster-hit areas, when power lines are down for many days, if not months. There would be cost savings for the entire archipelago and the size of the savings would be commensurate to the number of households and businesses whose partial or total energy resilience would make them suffer less in the aftermath of storm-induced black-outs. Obusan said a de-centralized energy system, through renewable energy is needed to power communities, especially those living off the main grid. A good example are small scale solar energy systems which have the ability to foster a small-town energy revolution by and for people, families, communities, farms, and small and medium sized businesses. A million homes with solar in the Philippines could raise installed capacity of solar considerably. • Light up communities through renewable energy technologies. In order to bring energy services to remote, off-grid, typhoon-affected communities in Visayas, this should be one of the principal goals. Communities that are located outside of the nearest electricity service areas should be energized using stand-alone RE technology such as solar PV and micro-hydro systems. • Include capacity-building for energy projects by creating partnerships with communities and providing technical assistance. • Provide micro-credit and consulting for the promotion of off-grid, decentralized RE technologies. • Financially support local entrepreneurs who could either benefit from energy access, or supply their communities with renewable energy services. • Institute an RE program in schools. With RE-powered multi-media technology, teachers and students will have the opportunity for better teaching and learning conditions. “The ongoing reconstruction will give the government an opportunity to rethink energy systems in these devastated areas. We hope Mr. Lacson will listen to our advice and do what he can to turn this tragedy into an opportunity. Now is the time to rebuild our towns and cities using greener and sustainable energy systems that are climate-resilient,” said Obusan. MANILA – Vice President Jejomar C. Binay Thursday said he welcomes the opportunity to help Senator Panfilo Lacson as the latter heads rehabilitation efforts for Yolanda-ravaged areas. “This is an enormous challenge that cannot be done by one person. Senator Lacson can count on my full support as well as that of the National Housing Authority (NHA) and other key shelter agencies (KSAs),” Binay said. Lacson earlier said he will consult Binay regarding housing rehabilitation efforts. The Vice President concurrently chairs the Housing and Urban Development Coordinating Council (HUDCC). Aside from the NHA, the KSAs under HUDCC include the Home Development Mutual Fund (Pag-IBIG), the Social Housing Finance Corporation, Home Guaranty Corporation, the Housing and Land Use Regulatory Board, and the National Home Mortgage Finance Corporation. Binay stressed the need to seek the assistance of the private sector in helping the affected areas recover in the wake of the super typhoon. “It is important that we get experts on board, not only from government but also from the private sector, especially in rebuilding communities,” the housing czar said. “We need to ensure that the new homes and communities we build for the survivors are sustainable and resilient to climate-change,” he added. When he was still mayor of Makati, Binay partnered with Gawad Kalinga (GK) in establishing a resettlement community for informal settlers in San Jose Del Monte, Bulacan. When he became HUDCC chair, the Vice President also enlisted the help of GK and other private groups such as Habitat for Humanity, Subdivision and Housing Developers Association, Inc., Chamber of Real Estate and Builders' Associations Inc., and United Architects of The Philippines to help government provide affordable and climate-resilient homes as well as close the 3.6 million housing gap. Binay also concurred with Lacson that the rehabilitation program should be implemented in a transparent manner. “Transparency is important in the rehabilitation efforts, especially considering the enormous funding for the program,” the Vice President said. According to the Foreign Aid Transparency Hub, which monitors the international aid the government received for the victims of Yolanda, the Philippines has received P22.07 billion or US$504.04 million in pledged foreign assistance. QUEZON CITY – “BS Aquino’s appointment of Gen. Panfilo Lacson as the ‘rehabilitation czar’ in typhoon-affected areas is the same as appointing Gen. Jovito Palparan to a plum civilian position in government. Nothing in Lacson’s bloody record indicate his competence to handle the rehabilitation communities affected by typhoon Yolanda. In fact, he is most known as a notorious torturer during the Martial Law period and his involvement in high-profile cases of rights abuses such as the disappearance of PR consultant Salvador “Bubby” Dacer in November 2000,” said Karapatan secretary general Cristina Palabay. Lacson is said to be among those responsible for the disappearance of Redemptorist priest Fr. Rudy Romano in Cebu in 1985 and the torture of activists Marco Palo, Joseph Olayer, Manuel Mario Guzman, Rolando Salutin and Rodolfo Benosa in 1983, when he was part of the Metrocom Intelligence and Security Group (MISG). He was also charged with multiple murder cases in the death of 11 suspected members of the Kuratong Baleleng in 1995. “The appointment of another favoured ally of BS Aquino who is most known for human rights violations is adding insult to injury. This shows the real intention of BS Aquino – to silence any emerging discontent of hungry and neglected victims of super typhoon Yolanda,” Palabay said. “We need a government that understands the plight of the poor people, look at things from their perspective, and support the people’s efforts to rebuild their communities. Even before the typhoon wrought havoc in Samar and Leyte, these communities were already poverty-stricken, thus, making people vulnerable to the impact of natural and man-made calamities. There was neither economic security nor basic services for the people. Efforts to rehabilitate and reconstruct the areas hit by the typhoon require a full grasp of the situation in these communities, especially of the poor peasants, fisherfolks, workers,” Palabay added. Karapatan said that the government cannot use the typhoon to escape its responsibility from its failure to address the people’s needs in these communities when BS Aquino assumed office. The government should have prioritized the implementation of genuine land reform, quality health services, education and housing, infrastructure development to spare or shield the people from the impact of natural calamities. On November 20-25, two teams from Karapatan went to Samar and Leyte to join the relief and medical missions organized by BALSA and Samahang Operasyong Sagip (SOS). The teams documented the situation in Samar and Leyte. Karapatan teams observed that pregnant women, children and those with wounds sustained during and after the typhoon need immediate attention but the hospitals are incapable of accommodating as much patients because it lacks personnel and equipment. Some hospitals were also destroyed. It would take six to eight hours travel to get to the next hospital in Calbayog or Catbalogan. Mosquitos started to breed in stagnant waters. Sanitation problems also put the health of communities in danger. There are still missing persons that are feared to have been covered by the rubbles but search efforts and the clearing of debris by the authorities were idle. “Samar and Leyte reeks not only of decaying bodies that BS Aquino have tried to downplay but also of corruption that exacerbates the already downtrodden situation of the people of Visayas,” ended Palabay.